There is currently just the 1 ferry route running between Spain and La Palma operated by 1 ferry company – Trasmediterranea. The Cadiz to Santa Cruz de La Palma ferry crossing operates weekly with a scheduled sailing duration from about 64 hours. Whilst we’ve taken great care to ensure the information on this page is correct, as the frequency and duration of crossings on all routes can vary from time to time we’d advise that you get a live quote for current availability on this Spain La Palma crossing between Cadiz and Santa Cruz de La Palma. Spain is a country located on the Iberian Peninsula and bordered by Portugal to the west, France to the north-east and the Mediterranean Sea to the South and East. The marvellous weather in Spain, its geographic location, beautiful coastlines and varied landscapes have made Spain one of the most popular holiday destinations in the world. 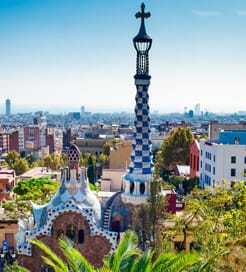 Its capital city Madrid features winding streets all heading to gather in the centre of the city, Barcelona needs no introduction, the Basque country is to the North and then of course there’s the sunbathers mecca – the Costa del Sol. As a country with thousands of miles of coast and numerous island groups such as the Canaries and Balearic's, travelling by ferry is deeply rooted into Spanish culture. Europe’s most modern ferries and well-known ferry companies are in operation providing services from Spain to the UK, Italy and North Africa as well as crossing from the mainland to the Canary Islands, the Balearic Islands and numerous inter island connections. 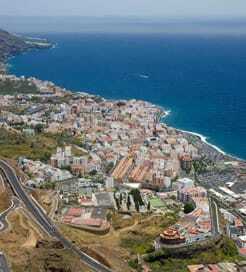 La Palma is the greenest and most north-westerly of the Spanish Canary Islands, found directly north of El Hierro. Worthy of its nickname, the ‘Pretty Island’ has been classified a World Biosphere Reserve by UNESCO, boasting the most immaculate landscapes of the archipelago. La Palma attracts mostly walkers and outdoor enthusiasts, with tourist-filled beaches practically non-existent. Instead it offers imposing volcanic craters, serene forests and a vast National Park filled with fascinating wildlife. When the sun sets, La Palma retains its beauty; the island’s strict light pollution laws have earned it Starlight Reserve status, resulting in truly mesmerising night sky views. From almost every island in the Canaries, you can sail to La Palma’s port in Santa Cruz, with a number of ferry operators offering regular sailings. There are also weekly, long-haul ferry crossings from Cadiz, on the Spanish mainland.